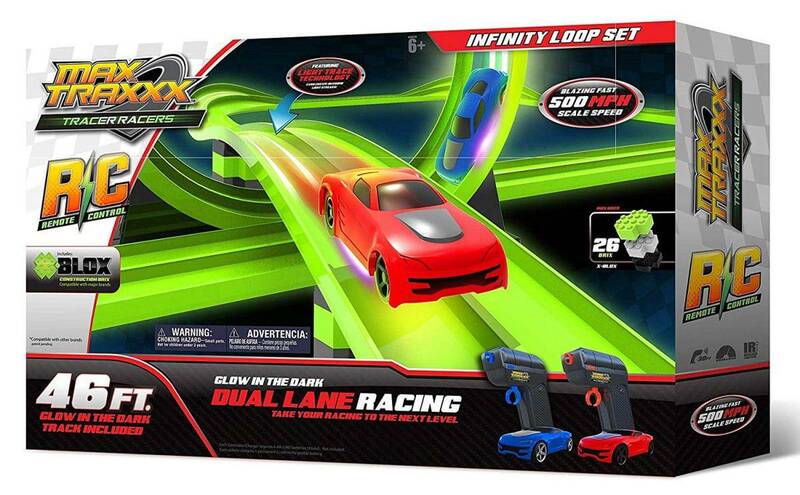 Race car track toys for kids have been and will be one of the most inspired gift ideas. Even with modern gadgets, simply playing with model cars on a dedicated track can come with feelings of excitement. For most kids, the choices vary. From American GT cars to futuristic or cartoon-inspired cars and tracks, the options can suit all personal preferences. There is no denying that the following best race car track toys for kids have their own identity with plenty of fun to be had. Why we like it: Based on smartphone connectivity, the Overdrive Started Kit is one of the most modern options at hand. The Anki Overdrive Starter Kit is one of the modern options for a race car track toy. 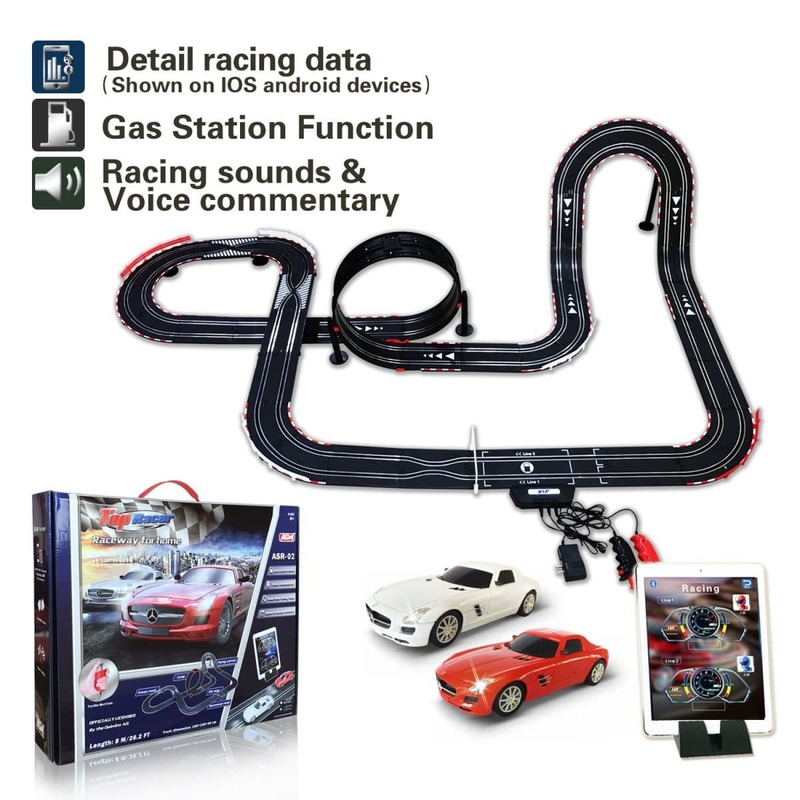 As kids already know, it comes with smartphone-controlled cars for the ultimate racing experience. Suitable for kids into gadgets, the race track also works with high versatility. The track itself has 8 epic battlefields which use corners of different angles and straight sections of different lengths to offer the ultimate playing experience. Loopback, The Point, Quadra, Capsule, Overpass, Microloop, Hook, and The Wedge are the options to consider. In some respects, they are inspired by some of the most popular racetracks in the world. Of course, these track elements can actually be expanded in time, to offer extra racing challenges. With new supercars and new curved, straight or riser pieces, the options for a custom track are practically endless. Those who wish to offer the kit as a gift also need to know racing is based on WiFi smartphone connectivity. Why we like it: With a flexible race track, Ontel’s design is perfect to improve playtime creativity. Most people think race tracks are fixed. 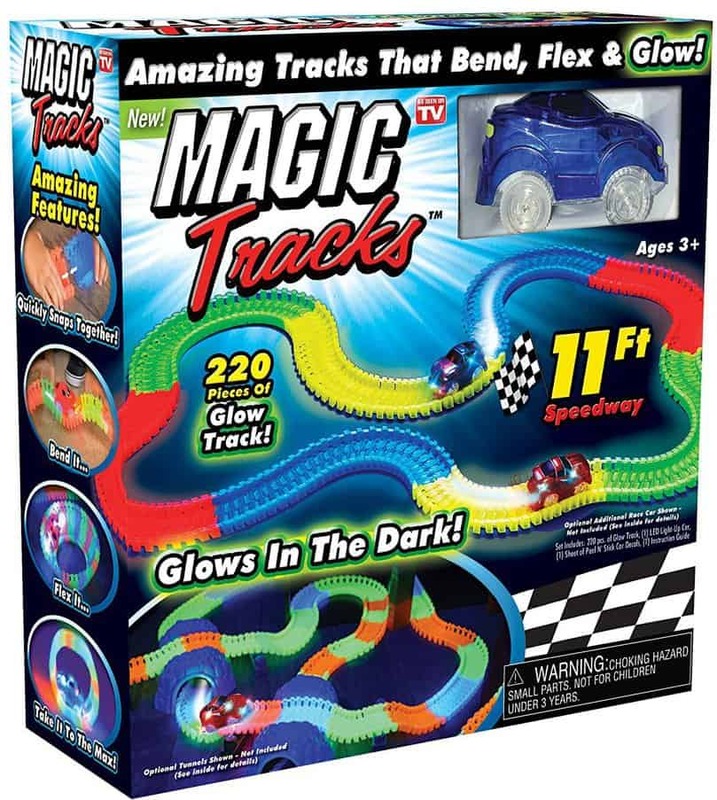 But the Magic Tracks’ design is indeed special. Kids can mold it and bend it to their desired shape, corners and heights. Molding the race track can come with extra racing motivation. To make it stand out even more, the manufacturer also added glow-in-the-dark features to the track. Putting the track together is not complicated and kids can do it with no help. All pieces are designed to snap together. When playtime is over, the entire track can roll up due to its flexible nature. With two included cars, the kit can offer hours of versatile racing that kids can love. Why we like it: Inspired by the powerful Fast & Furious cars, the kit can be an inspired gift idea. Not many race car tracks toys come with movie inspiration. 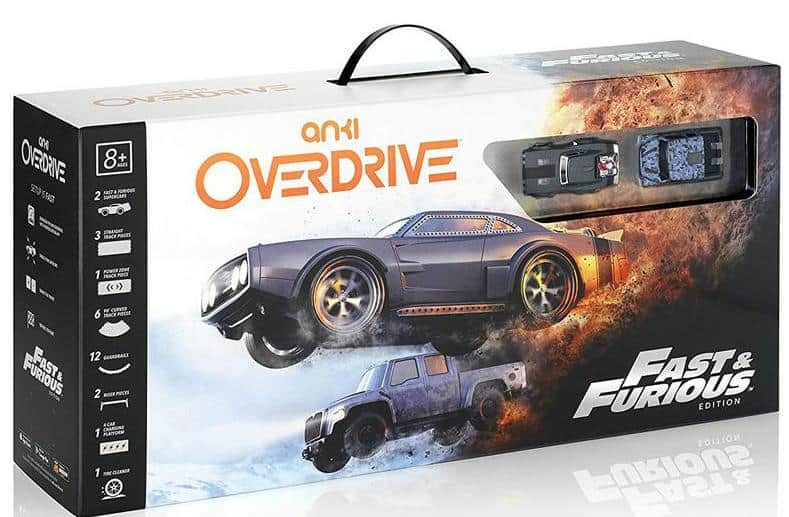 But Anki has released this special edition based on the popular Fast & Furious series. Apart from the branding, the track remains similar to what can be seen today in the Anki lineup. With 2 Fast & Furious cars, the kit offers hours of fun for boys and girls. These cars are equipped with powerful 50Mhz CPU motors and included optical sensors. There are three straight race track pieces which are shipped as well. The pack also includes 6 curved pieces as well as other pieces such as the power zone. Based on the same popular smartphone integration, racing can actually be based on multiple devices. The race car track is tested on all Kindle Fire editions, all iPhone releases, and most Android-operated devices. Why we like it: With a length of 5 feet and a suspended design, the race car track is a must-have for Pixar Cars 3 fans. Since the race car track is inspired by Cars 3, it comes with specific elements which fans of the series recognize immediately. 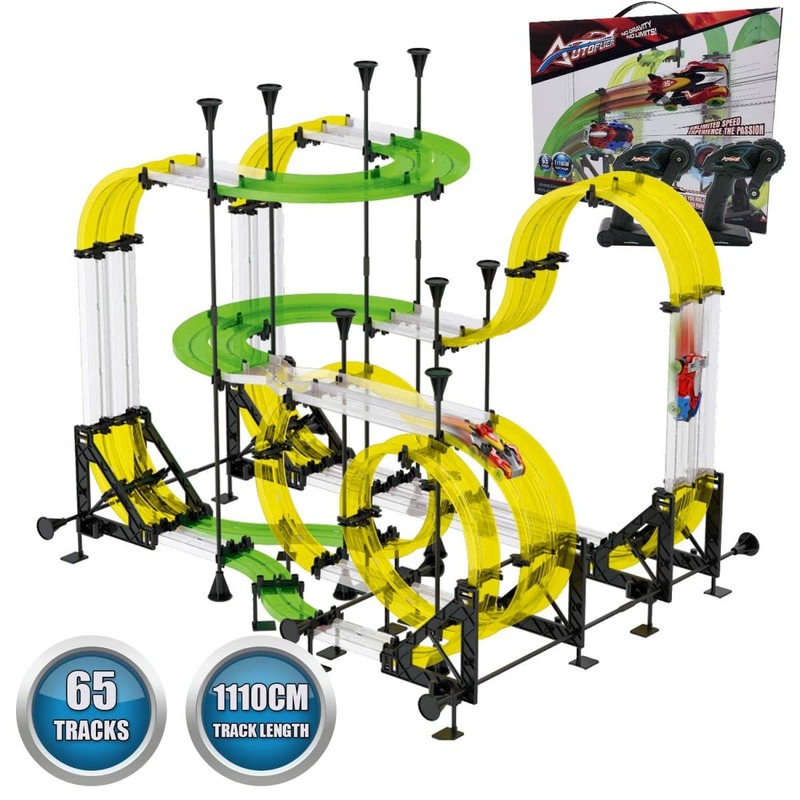 It is considered to be the largest raised track design on the market and it offers a unique playing experience as a result. It even includes a motorized booster to keep the included Lightning McQueen racing at top speeds. The biggest track in Cars’ history is a must-have for kids who love quirky cars from TV. Based on interactive wristband controls, kids can race to the finish line to see who’s the car is the fastest. The good news is that the race car track is also compatible with other Cars race car tracks. The likes of the Spiral Garage and the Florida Speedway can be connected for added racing fun. Why we like it: This complex race car track is as special as Hot Wheels fans can hope for with an included crash zone. Hot Wheels remains one of the most important names in the race car track world. The Criss Cross Crash Track lives up to its name. Cars can actually meet and crash around the center of the track, which only adds to its spectacular feel. With difficult intersections and hairpin turns, kids can play on the edge of their seats waiting for the right moment to avoid a car crash. There are other unique track characteristics kids can enjoy. For example, the car feeder design is unique as it prepares cars for their ultimate race. The intersecting track design will also challenge kids from near misses to full wipeouts. 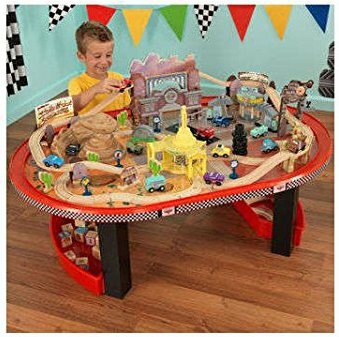 With a raised profile, the race car track is ideally set up on a table or even on the floor. Why we like it: The racing track is one of the designs which glow in the dark for a more dramatic visual effect. Based on 45 feet of racing track, the Max Traxxx is the impressive choice kids can rely on when they want to become serious about racing. With two included remote control cars, they can challenge their friends or parents to a quick race to determine the ultimate driver. As the race car track is quite long, it is recommended to place it on the floor. It is here that the kids can make the most of its glowing design. But it also adds other cool visual effects such as undercarriage lights which add new dramatism to every race. Most importantly, the actual race can benefit from variable car speeds which means kids can have their own strategies going into every corner and straight line. Why we like it: This incredible track is recommended for kids who want to enjoy the most surreal racing experience. With such a crazy design, the race car track toy is perfect for added racing excitement. Apart from taking cars high and low or through narrow turns, the track also features a crash zone where anything can happen. From simple near misses to actual crashes, this zone adds even more excitement to play time. With two launchers, kids can start racing at the highest speeds. The manufacturer also included a racing car in the kit. But parents would need at least another car for competition purposes. 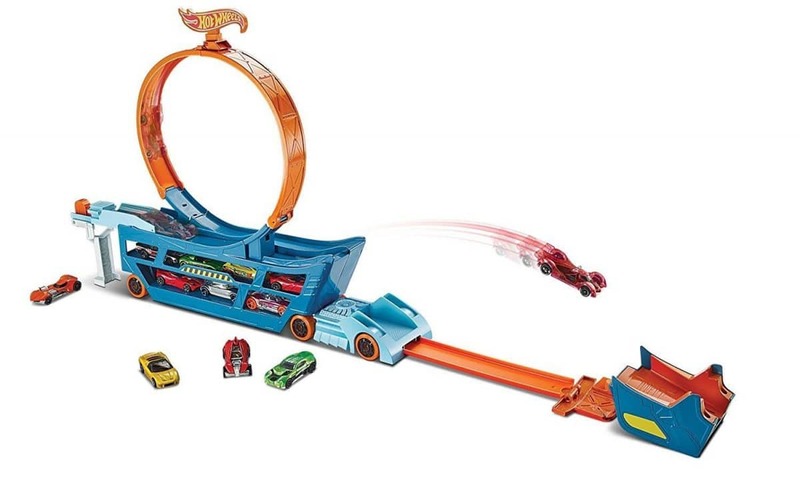 The good news is that, similarly to most Hot Wheels tracks, the set can be connected to other racing tracks. 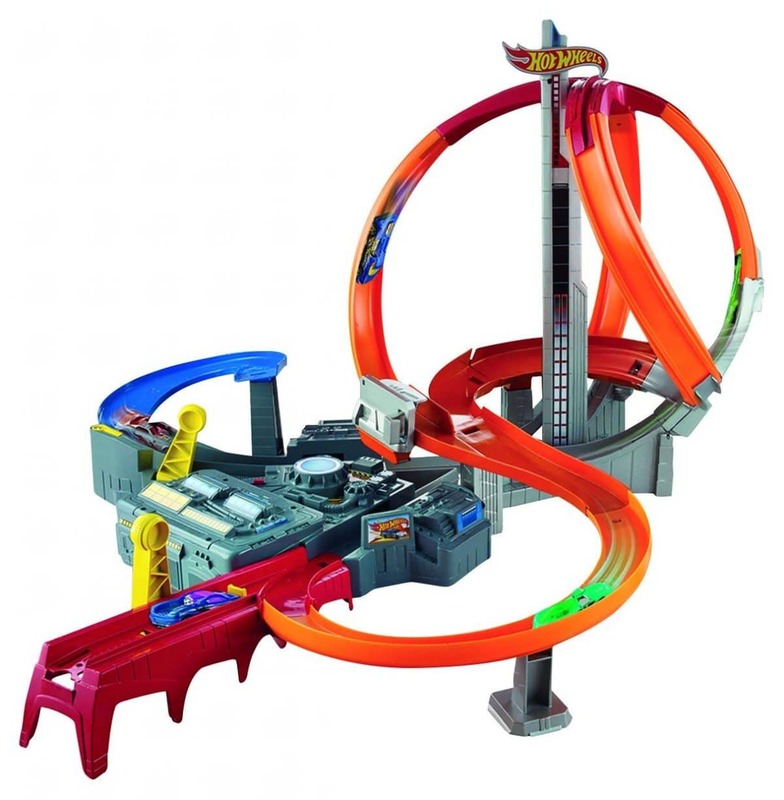 Those who might already own a Hot Wheels track can combine the designs to double racing fun and the number of possible crash intersections. Why we like it: With a modern approach, the race track is perfect for added multimedia effects. Controlled from smartphones or mobile devices which can run apps such as tablets, the smart track is recommended for kids who enjoy a full racing experience. This experience is based on the fact that the track comes with added live racing commentary. Special racing effects can be heard as well. 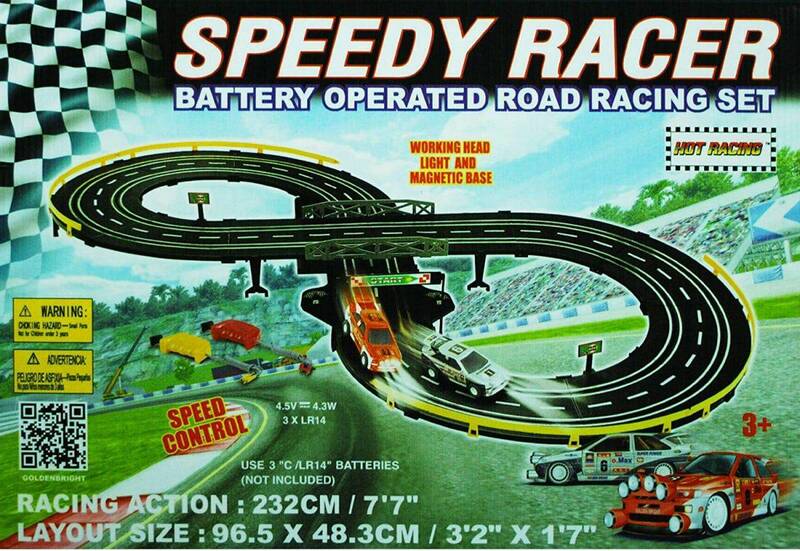 But with a comprehensive design, the car race track can easily keep kids busy for hours. It is why it comes as one of the most impressive tracks for length. 8-meters long, the track actually offers enough space to catch-up with the other racer or to put the car behind even further away from the finish line. With complex racing options which take cars through spectacular loops or through impressive overpasses, kids can control their Mercedes SLS AMGs through iOS and Android devices. Why we like it: With a 4-level design, the track is recommended for those who want to park their racing cars. Matchbox is a leading name in car toy production. Its 4-level garage can be a great addition to any type of racing track. Parking cars after an intense race can be relaxing and fun. The good news is that the garage also comes with plenty of other attractions to keep drivers occupied before the next race. Featuring a car wash, a gas station, and a working elevator, the garage is equipped with everything fast cars needed. With a spiral design, it is also fun to take the cars on one of its levels looking for the perfect parking spot. The manufacturer also knows that some racing cars break during or after the race. It is why it offers a tow truck to take the cars into the garage. Additionally, parents can also purchase Matchbox cars to populate the garage. Why we like it: This all-in-one kit is a tempting choice for those seeking two-car racing fun. 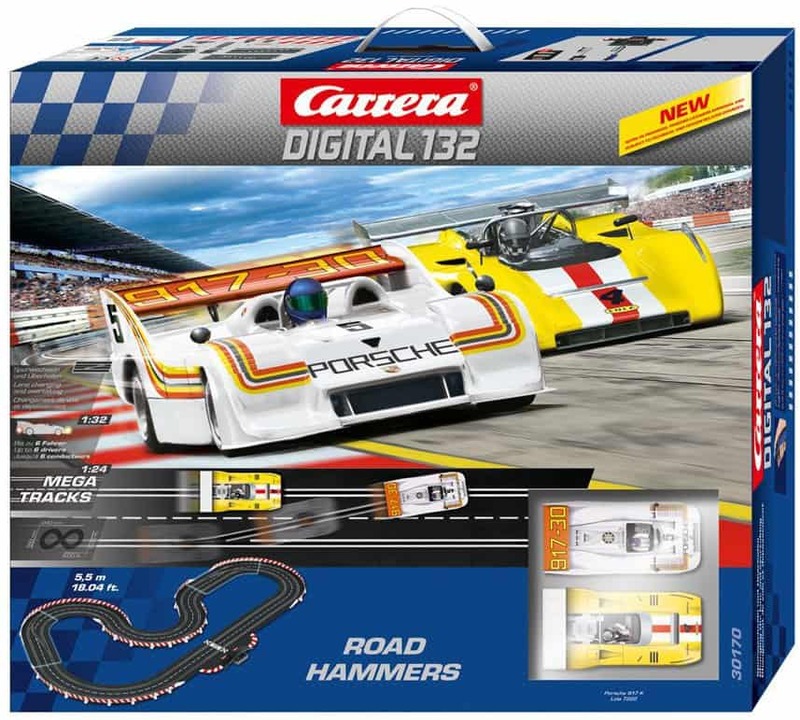 Based on a simple design, the race car track is compatible with Carrera cars. It already includes two racing cars in the kit. It means that it can be one of the impressive options for those who don’t want to waste any time looking for cars to add to a basic track. 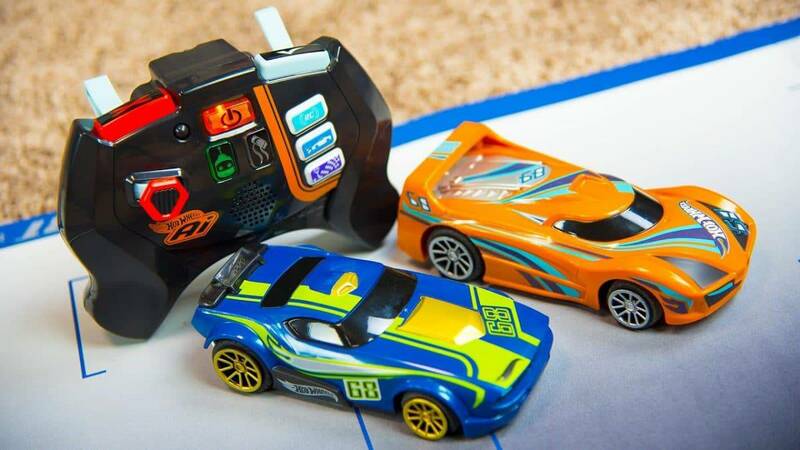 At the same time, the pack includes two controllers to make the cars go faster and faster. The track itself is made to favor high speeds. Its intersection point means that both cars can meet at a certain time during the race. The key to successful play for new racers is to actually start controlling the car at lower speeds first. When kids have enough confidence in their car-control skills, they can start adding speed through the controllers to start racing performance. 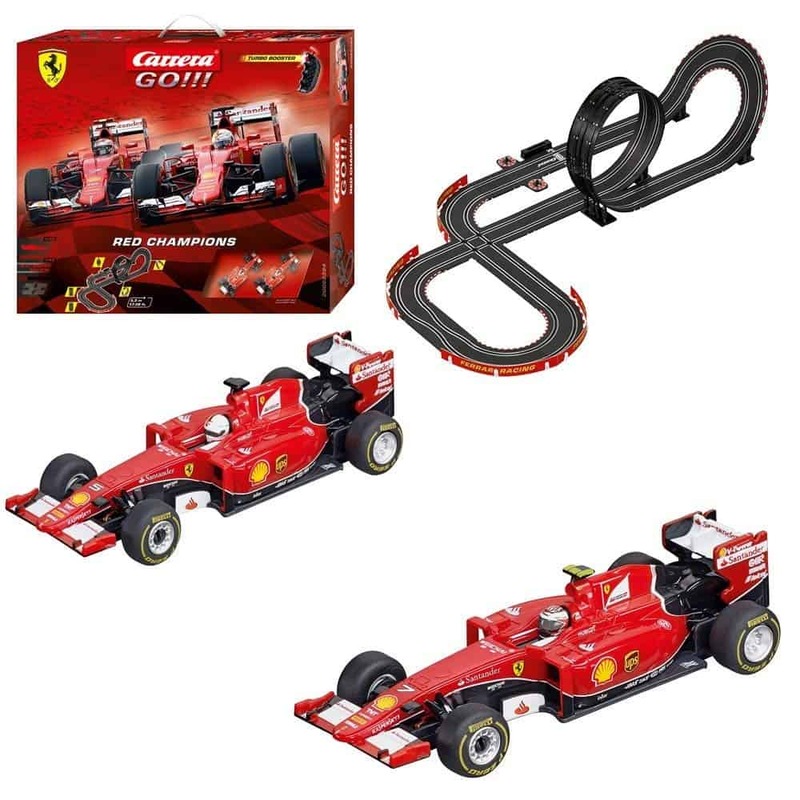 With an included Ferrari car and a Chevrolet touring car, kids can take full advantage of the track by establishing new methods of finishing first or even eliminating the opponent’s car at the intersection. Why we like it: Made for side by side or head to head racing, this unique track is made to offer the most fun with car crashes. Since not all race car tracks are made directly for crashes, it can be one of the unique and fun designs to consider. Kids can make the most of its design and even recognize its qualities by working as a team with side by side crashes. At the same time, the track can be positioned so that kids can go head to head with their cars crashing into each other. One of the ways in which Hot Wheels promotes the set is by actually encouraging slow-motion car crash videos. For this purpose, kids need a smartphone which comes with slow-motion recording positioned in the right angle. The results can be quite spectacular, especially if the cars crash head to head. Since the manufacturer has a large car selection, kids can also benefit from most Hot Wheel cars for their crash-style track as they fit with no issues. Why we like it: With a simple design, this can be the first race car track to consider from Carrera’s designs. Inspired by the Cars animations, the race car track features a simple and fun design. Simply based on racing performance, it doesn’t come with the possibility of cars actually crashing into each other. It’s fun is based on pure racing performance. When it comes to the actual cars, kids can find recognizable names to control. The included Lighting McQueen and Dinoco Cruz are battery-powered and they can fly with high speeds around the racing track. The design of the track allows for hours of fun. With a length of just under 8 feet, it is one of the larger tracks to consider. Placed on the floor, it can have kids watching over the cars as they race each other to the finish line or for multiple laps. As a two-player game, it can be recommended for families or brothers and sisters which can play together. But even if the cars look simplistic at a first sight, they actually come with electronically-regulated speed so that they can offer an adjustable performance. Why we like it: Stunt race car tracks can’t get any simpler than with the Stunt Box, even for kids as young as 4. 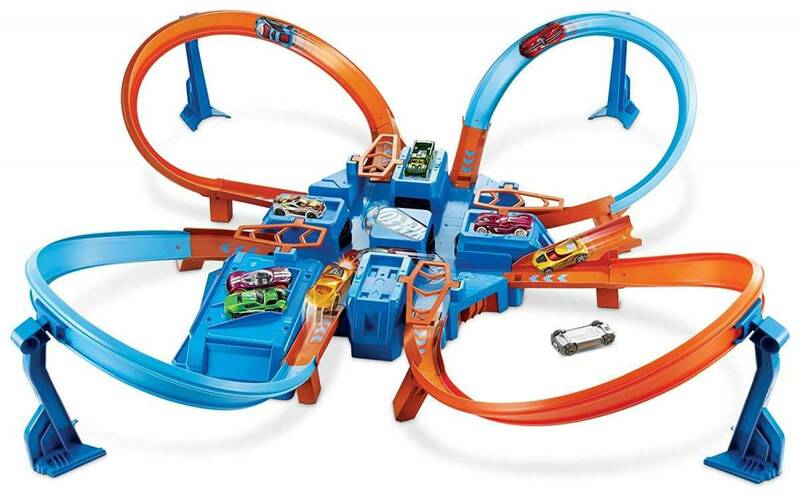 Hot Wheels has designed this stunt track to offer something extra compared to a race track. It includes a Hot Wheels car which needs to go through various challenges and find its way to the end of the track. The entire track ships in a bin-style box which can also be used to be part of the actual track. It can raise the track from the floor and make the cars run uphill and downhill over the bin. There are 35 customizable pieces which ship with the track. All of them can be used together or kids can select their favorite pieces to put together an amazing stunt track. One of the distinct characteristics of the track is that it can also use household items for a custom track experience. For example, kids can use books to enjoy new stunts every day. Parents can also appreciate the design of the track which can fit entirely in the bin it ships in. It is why kids can completely assemble and re-assemble the track from the bin as often as needed. Why we like it: This simple race car track is an option parent can consider for toddlers. It comes with 4 cars for hours of fun and giggles. The race car track is a complete solution for those seeking to play with their toddlers. There are no remote controls to worry about, just plain cars which might need a push here and there to get through the track. The manufacturer ships the track with 4 cars kids can play with. 3 trees can also be added for decorative purposes. A helicopter can also be used in case of emergency as it’s included in the kit. Made with different colors, the racing track can improve toddlers’ visual impressions. It represents a simple solution which can be used for hours and hours at a time. But it’s not about learning with no fun. Kids can make the cars go faster and faster around the track. 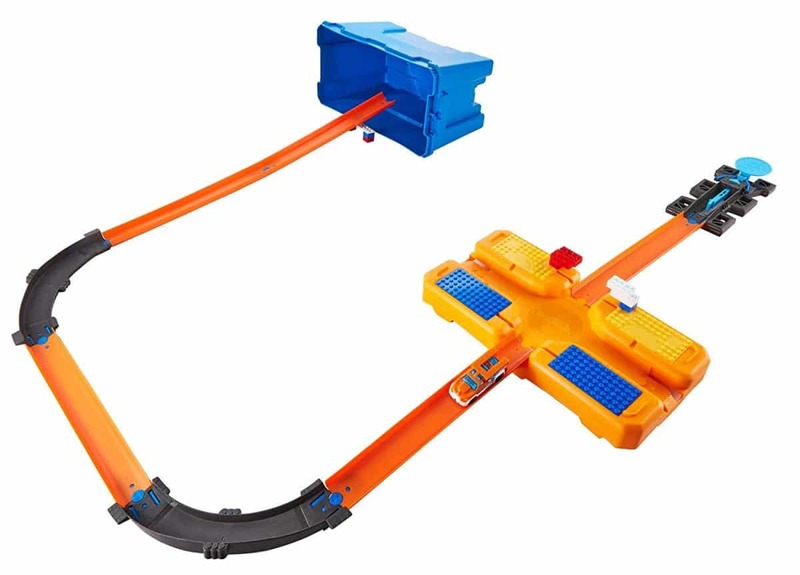 Built with durable ABS plastic, the track can handle everything kids throw at it. Why we like it: With over 30 feet in length, the track is aimed at kids who want enough space to reach maximum racing speed. At 30 feet, this race car track represents a viable option for high-speed racing. In fact, kids can expect to reach a top speed of nearly 9 miles per hour with their racing cars. Of course, the most spectacular part of the track are the two loops. They are the ones responsible for the cars’ performance more than any other part of the track. When it comes to operation, the toy is not complicated to use. 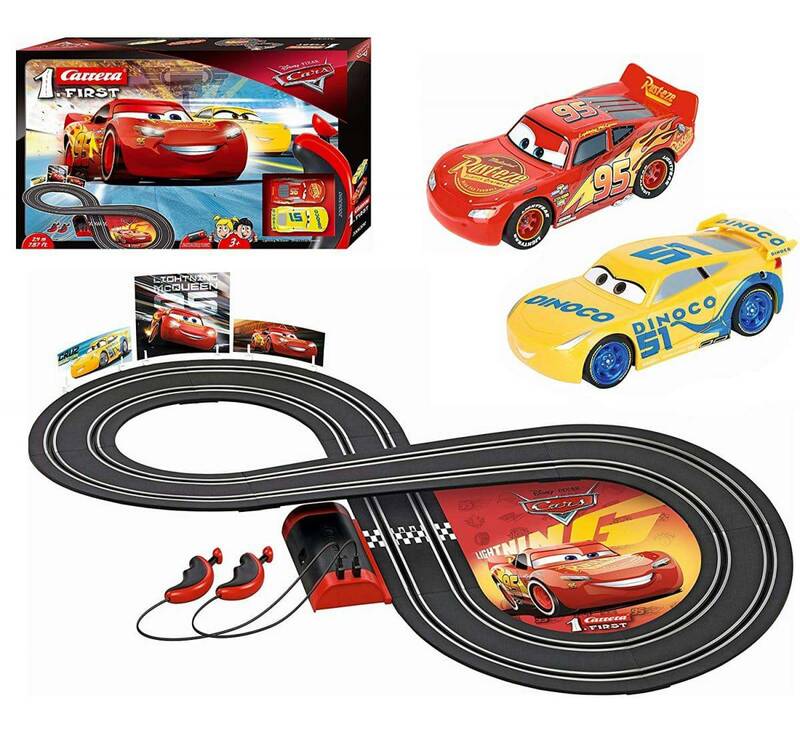 Kids can find their own way around the track simply using the two cars which are shipped with two controllers. Each car needs to cross the finish line at least one time before the other car to win a race. Multiple-lap races are also a great option for kids who want to enjoy continuous fun racing. But of course, there is a moment when the track starts to get old. This is when kids can be inspired by the 5 printed double loop designs for more hours of racing. Why we like it: Dinosaurs have always fascinated kids. Now they are present around this versatile track. There are not many race car tracks which can fit dinosaurs around them. But Homofy has managed to create one of the best solutions when it comes to integrating the majestic creatures as decoration around this military-style race track. In many cases, it represents one of the simple solutions to be considered for kids as young as 2. 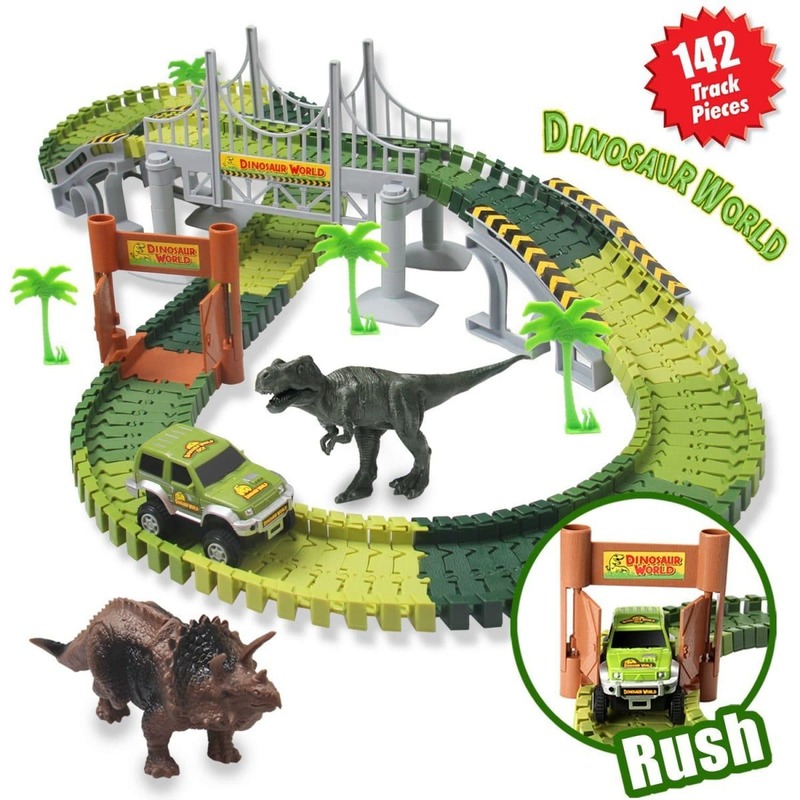 But at the same time, the endless track possibilities with its over 140 pieces make it a unique attraction even for parents. Military vehicles powered by batteries are included in the pack. They come to race on what can be a short or a long track, depending on how the kids decide to construct it. With bridges, trees, and slopes, cars can travel around the race track facing various challenges. Enjoying the prehistoric world and all that it has to offer is now combined with race tracks to offer a unique educational perspective which can even improve imagination with all of the customizable parts which are part of the kit. Why we like it: Enjoying the ultimate Ferrari cars can be all that’s needed for successful racing. Shipped in an updated attractive box, this race car track comes with everything kids need to start enjoying their Ferrari cars. It’s not too complicated to put together. 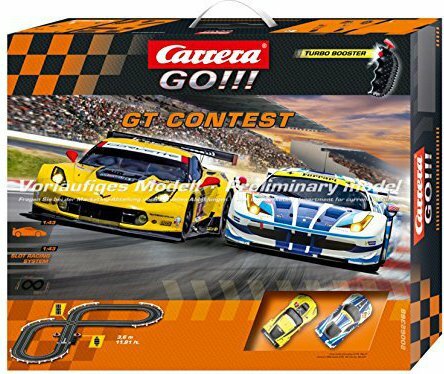 Carrera offers the race car track parts which can be as long as 28 feet when all of them are connected together. Of course, these parts include straights, curves, and high banked curves. 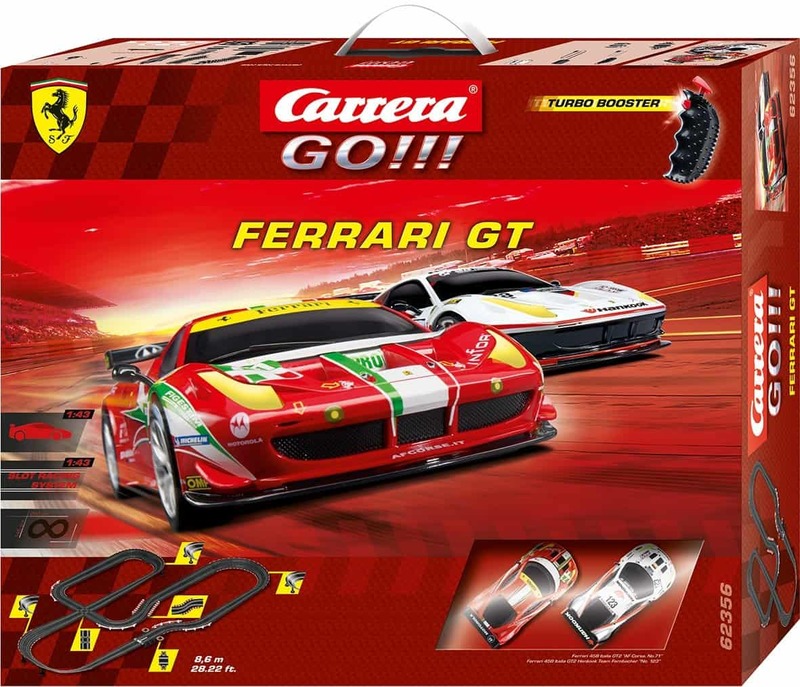 In the set, kids can also discover one red Ferrari 458 GT2 and one white Ferrari 458 GT2. With their own remote controls, these cars are ready to reach impressive speeds on the long track. With added guardrails, flying the cars off the track might not be as easy as with other tracks, which means kids can go for full speed racing. Why we like it: The set is recommended for most Disney fans who can enjoy a wide selection of cars and a unique track. Made with a Disney-inspired theme, the race track is among the sturdiest kids can hope for. Toddlers can be mesmerized by the Radiator Springs, as they can be impressed by the long length of the track. Assembly is not too complicated but since it comes with detailed decoration, having the track installed on a small table is recommended. 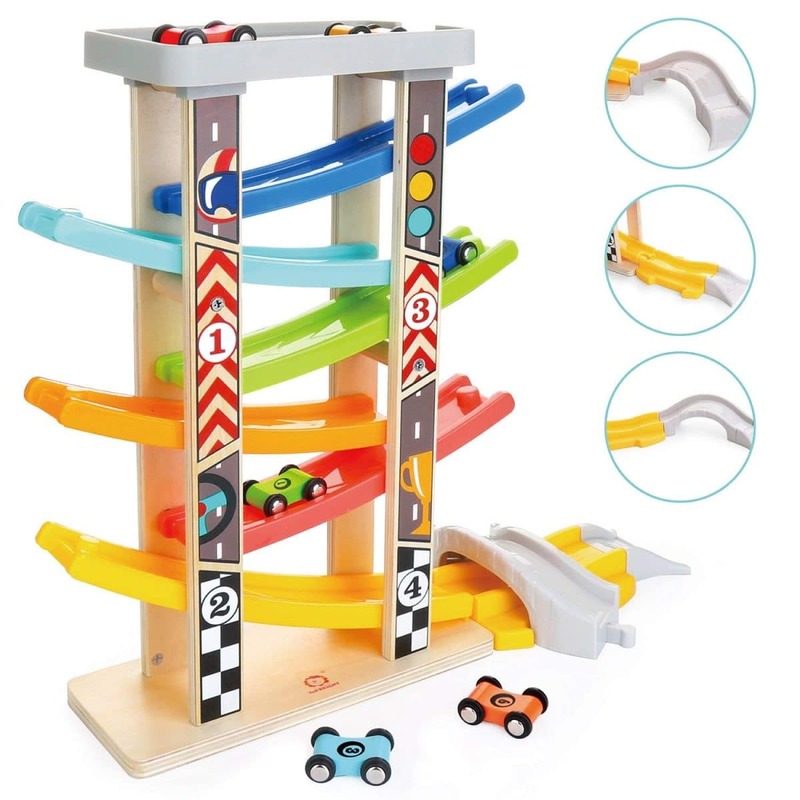 Based on actual Disney wooden toys, the race track is among the most durable designs to consider. Even sitting on it will not damage the track. Another major advantage is the fact that the track mainly has an oval shape. Kids can follow the cars along the track without losing them out of sight. There are 90 pieces of track and accessories to be installed by kids or by their parents so that the entire racing experience is truly at its highest potential. Why we like it: This multi-level Speedway is inspired by the Cars series and it can be used with any Pixar track. 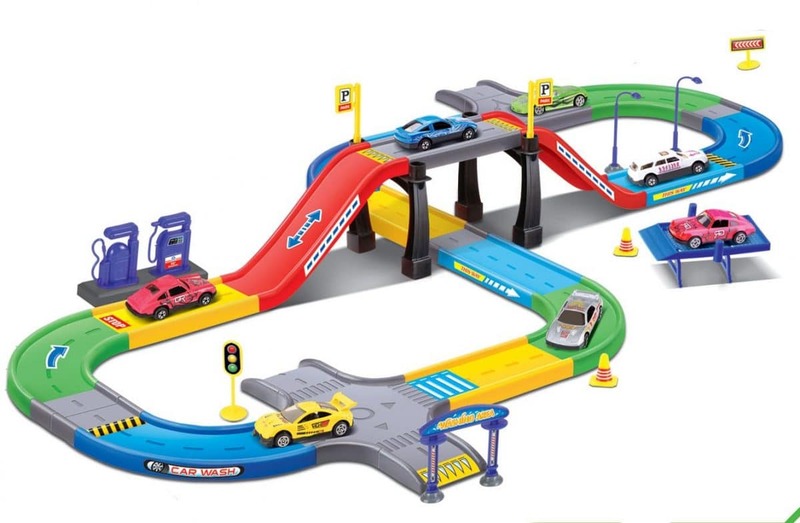 Based on the friendly Cars series, the Speedway Spiral Playset is recommended for parking various race cars. Made with durable plastic the Speedway Spiral stores cars on the bottom level and on the top level. The set is also ready to be used for storing other Pixar-inspired cars. At the moment, the set only ships with one Pixar car. The Lightning McQueen can be the car which kids play with and park as they want. 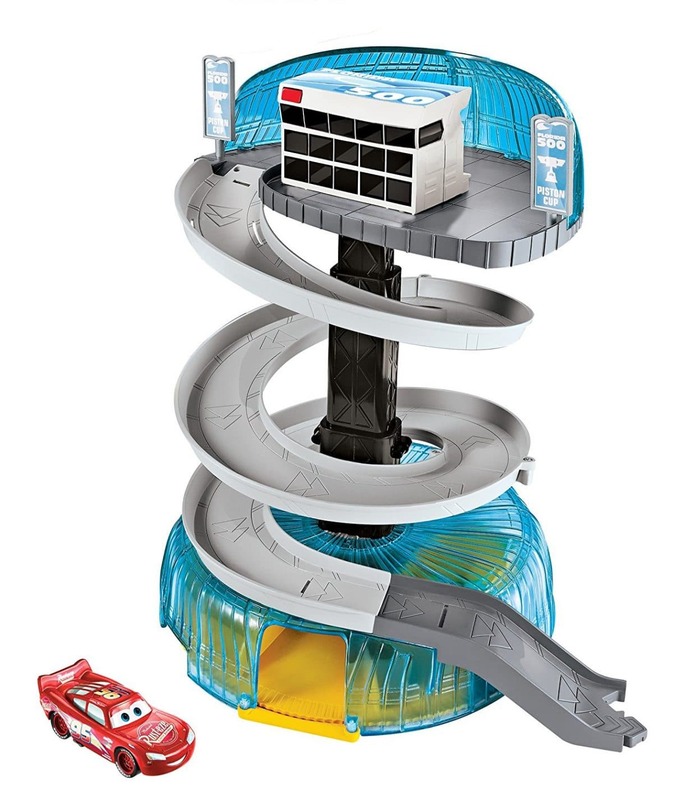 But the full advantages of the playset can be considered when it’s connected to other Pixar race car track toys. The best experience is had when it actually connected to the Florida Speedway set. But even on its own, the Speedway Spiral can even function as a car storage box while traveling. 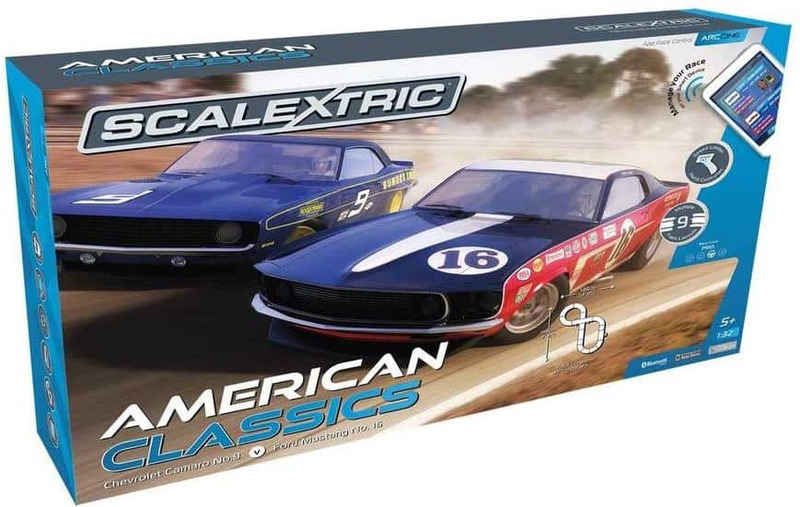 Why we like it: With smartphone integration, this race car track toy is perfect for the American classics. Inspired by classic American cars, the race track is actually modern as it utilizes Bluetooth connectivity. Both cars of the set are actually wirelessly controlled through a smartphone or through a table with the aid of the official app. But the app comes with much more settings than simple control. It includes controls for fuel consumption, lap counters, pit stop strategies, tire wear, and even post-race statistics. The track itself measures 16 feet and it can be built in 3 layouts. Why we like it: Made for toddlers, this fun set can keep the little ones busy while parents attend to other chores. This simple design can actually be one of the most fun racing tracks toddlers can consider. Made with an efficient design, it represents a design toddlers get to love more and more. Each car flips over at the end of a track piece in order to get down another track piece. This is fun to watch and it can even teach toddlers a few things about gravitation. Made from wooden materials and durable plastic, it is the perfect solution for when toddlers get tantrum and start throwing things around. Parents can rest assured the racing track will remain in good condition for all future races. Why we like it: This unique race track can offer real 1:32 scale cars for the ultimate racing speed. Based on touring performance, the race car track toy is one of the leading options kids can consider for a fun day with a friend. Boasting a Lola T222 and a Porsche 917/30, the race track comes fully equipped so that kids can start racing immediately. But children love extra options on their toys and the added speed control allows them to enjoy races even more. Two kids can play together so that the track can be enjoyed when a friend comes over or it can even be the attraction of a party. Why we like it: American Chevrolet and Camaro racers can inspire races all around the world. Kids can truly enjoy an all-in-one racing kit. The track measures 16 feet if fully assembled. It handles all types of Scalextric cars. 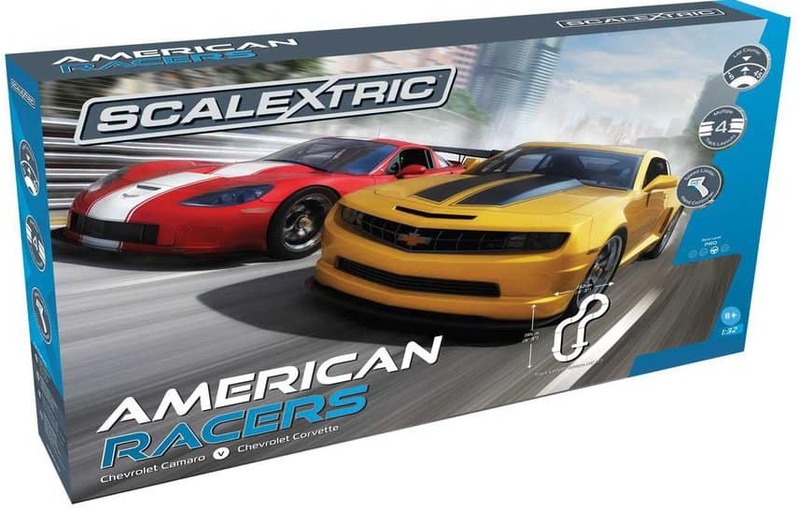 But the kit comes with the Chevrolet Corvette and the Camaro to offer an all-American racing experience. These cars are known for their impressive horsepower and kids can make the most of the designs. At the same time, their power can be controlled for better race strategy. Car controllers allow users to select a lower or a higher speed while out on the track. Why we like it: Formula 1 fan now have their own reliable and fast race track to use in the comfort of their homes. No car can ever be outperformed by a Formula 1 car. The Carrera track includes Ferrari cars which are capable of reaching speeds of up to 370mph. But these Formula 1 car is not going to perform on their regular tracks. Carrera made a racing track which includes a loop and a junction. The results of this daring design are hard to imagine. From near misses to full crashes, the track is demanding on the fast Formula 1 cars. Why we like it: Racing inside tubes sounds crazy but this is what Zoom Tubes does best. The intriguing race car track toy is impressive in its originality. It represents a solution which is easy to use as cars can’t actually jump out of the tubes. Connecting the entire track is not complicated. All tubes need to be connected together with a single track where cars can race for laps. Once the tubes are connected, cars are inserted inside and then they are controlled with the help of a remote controller. 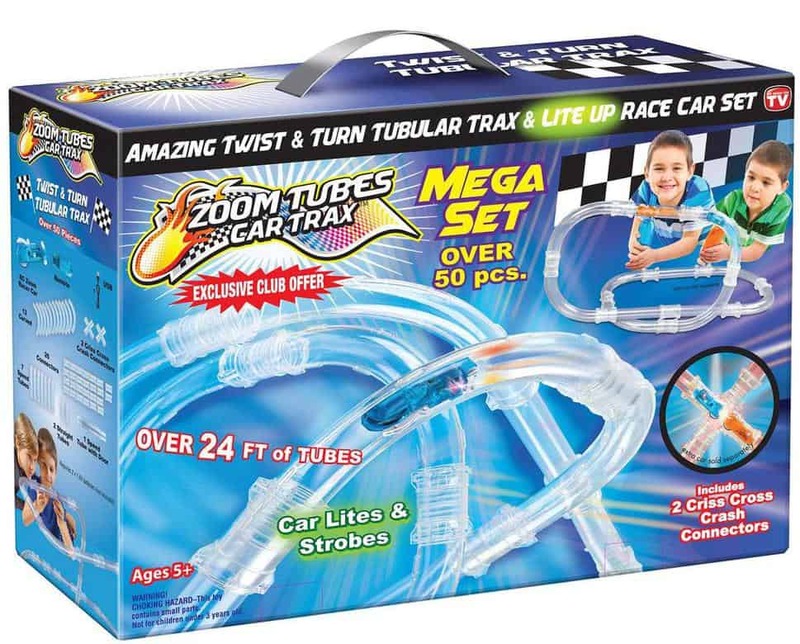 The crystal-clear tubes offer a visual experience like no other race car track. 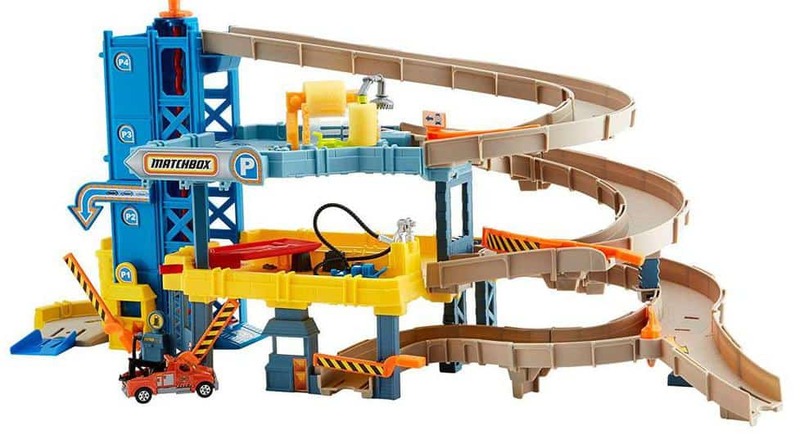 Why we like it: This simple playset is the perfect car track for kids just getting into racing. Made with durable materials, the race trace comes with multiple accessories and decorations. There are 41 pieces of track which need to be put together. Accessories include traffic lights, traffic signs and gas stations. In a way, the track mimics the roads of a real city more than those of a race track. But kids also get 3 metal cars which can be driven along the track. Why we like it: This classic 8-shaped track comes with two cars and is ready for racing in minutes. The oval and the 8-shape are among the most popular track styles. Golden Bright’s design comes with such an 8-shaped design which is easy and fun to use. Using the magnetic force, it keeps the two cars on the track. Kids can enjoy such a design even with advanced characteristics. One of them is the added lap timer. 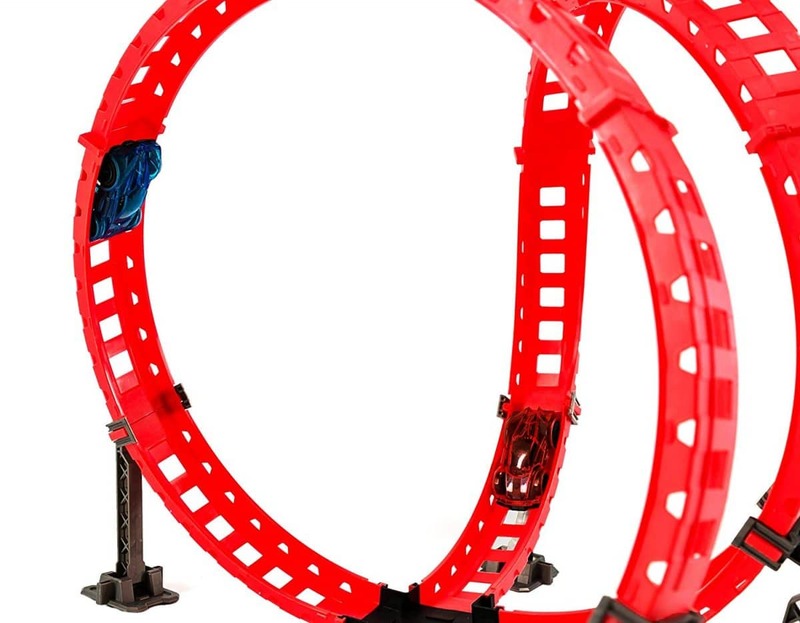 Why we like it: The endless loop is one of the constant thrills kids can enjoy on race car track toys. 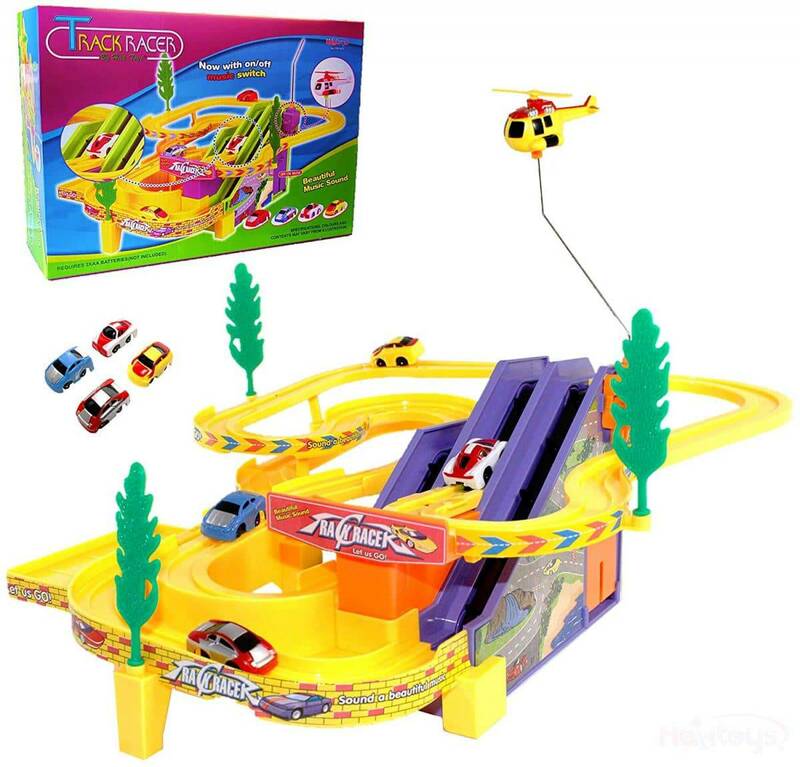 With a multiple-loop design, the track is a top choice for toddlers. It uses a simple design which can be arranged by them or by parents to create different loops. The included cars which come with the set gain spin with a pull-back motion. The result is epic turns at fast speeds. Why we like it: With vertical, horizontal and diagonal tracks, the set is as fun as most kids can dream of. Based on a do-it-yourself design, the race car track toy is perfect for kids looking to improve the way they play with their cars. The set uses remote control cars which are recommended for immediate response. In fact, its remote controls are unique as they use hand motions to control the speed of the car. Why we like it: This launcher comes with adjustable speeds and the possibility of launching two cars at the same time. 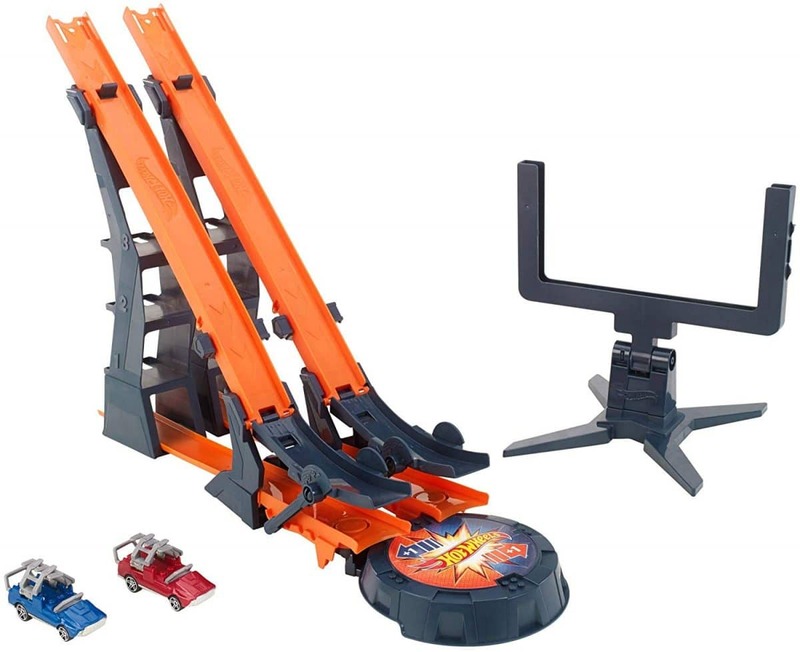 Hot Wheels has made one of the most fun stunts tracks with its 4-speed launcher. It even comes with an impressive hauler which handles up to 18 Hot Wheel cars. Unlike other car tray toys, it also comes with the advantage of portability. Some of the best race car track toys race come with endless fun possibilities. Each race is different and it comes with its own challenges depending on the opponents. Kids can take full advantage of their current tracks by adding new pieces for different designs and new cars for a different performance. Apart from coming with fun moments, racing tracks can also boost creative thinking as kids can design their own tracks from scratch.